In another installment at our look at the recordings of Jack Kerouac, Aeolus 13 Umbra turns its attention to this little gem, "October in the Railroad Earth," yet another pairing of Jack Kerouac and Steve Allen (see Jack Kerouac: Readings From On the Road and Visions of Cody). In this short piece, cut one from the 1959 album Poetry for the Beat Generation, Kerouac teams up with the talk show host to paint an aural portrait of San Francisco in the classic Beat style — spoken word and jazz. 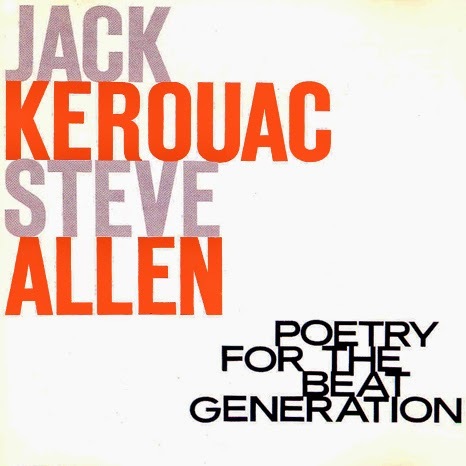 Allen’s accompaniment to Kerouac’s readings have been described as “cocktail music” by some, but that really does a disservice to both Allen and Kerouac. Kerouac, in fact, selected Allen for this piece, and it is easy to see why. Allen’s work both establishes the mood and underscores the emotional temper of the text. Listening to this piece, one can grasp the passion and frenetic nature of Kerouac’s stream-of-conscious narrative. Contemporary critics of his style dismissed Kerouac’s writing as undisciplined, yet very much the opposite was true. Kerouac’s early style owed much to the influence of Hemmingway, but it was his passion for life that influenced his work. Much in the same way Picasso’s early critics dismissed his abstract work while being unaware that he was also trained in the more realistic classical style. Life, however, inspired Picasso’s art very much in the same way it also affected Kerouac's — it compelled them to leap beyond their training and embrace a new form of expression that both reflected and influenced the era that gave them birth. Kerouac wrote his drafts on rolls of paper with the ends taped together so that his pacing wouldn’t be interrupted by the turning of pages (something he managed to overcome for public readings). His description of San Francisco and the marginal and forgotten characters that he encountered on the docks and in back alleys is so evocative one can easily imagine oneself at Kerouac’s side as he takes us on a hipster’s two-dollar tour of the City by the Bay. Kerouac’s creative word play — amply demonstrated here — is not simple riffing; it is analogous to Allen’s piano as it establishes the mood as well as provides subtext.